After a long bout of considering its options, only to determine that Sunday nights will continue to exist and Homeland can only fill, at most, 12 of them a year, Showtime has renewed its entire comedy lineup of House Of Lies, Shameless, and Californication, until such a time as one of those two factors can be addressed. 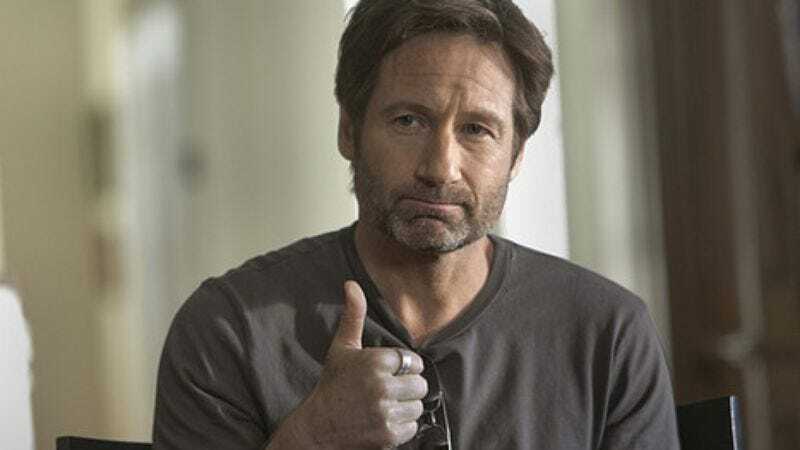 Each of the three series—which will be entering their respective third, fourth, and "Doesn't David Duchovny still get X-Files money? Jesus" seasons—have all pulled larger viewing numbers since their last seasons, a rising tide lifting all boats that spurred Showtime president David Nevins to praise them while mentally reminding himself that it's impossible to renew Weeds. “Californication, House Of Lies and Shameless possess highly distinctive comedic voices, and given that all three continue to grow their audience season after season, the pick-up decision was easy,” Nevins said of this one specific time when he did not agonize over whether to cancel something. He then muttered to himself, “And now I rest, having briefly spared them the dangling sword of Damocles. But for how many seasons more?” In semi-related news, Cinemax has granted a second season to Banshee, the network obviously hoping this extension will spur them to finally get around to the episodes sitting on its DVR. “We hear it’s kinda dumb but not too bad,” Cinemax probably said.